Books are beautiful. Books are important. Books in decor contribute to a feeling of homeyness. I love having books in my home and I treasure those that I have. But why would you arrange them by color? This is the third in my series of design trends that I love the appearance of but I would never implement. Based on the discussions on line, I am not alone in this one. 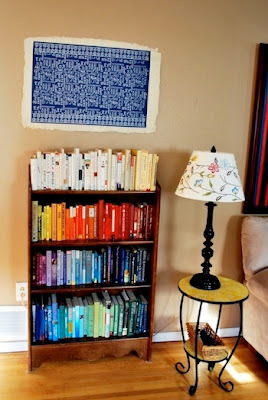 Books deserve a place in the home because of the value of the material inside and one can only find that information if they are organized in a fashion that allows for use. How do you find information in the colorful arrangement? I would be able to find the Dummies books because I have learned they are always yellow and also The Yellow Pages. But what color is "The Help", or my Filemaker Pro books (lime green, yellow and black for my three ready references). 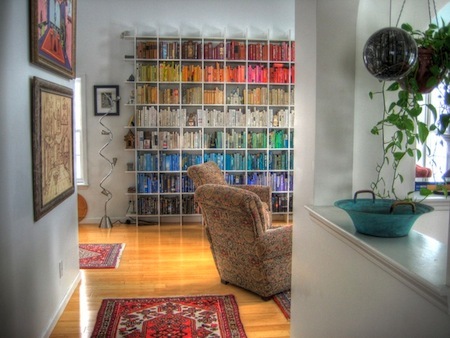 What a color coded nightmare! 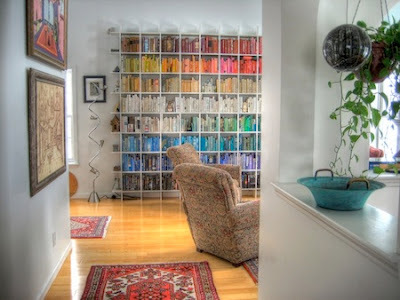 If the books you have aren' so superfluous so as to be hidden in a color treasure hunt then one should seriously consider parting ways with them and instead putting in a colorful work of art. I do agree that books aligned in a rainbow parade are indeed visually stunning but books need to be used! Personally, I organize by subject matter for non-fiction and then fiction by category. I will, within a category arrange by size for visual reasons so I do have a little OCD in me! Although in reality, we have cut our collection by at least 75%. We still have hundreds of books but, with digital resources we no longer have thousands. 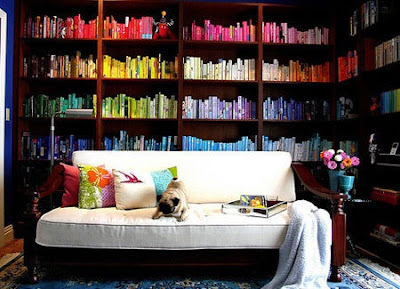 When I see a library like this one I find myself wondering if they buy books because of the color of the cover! 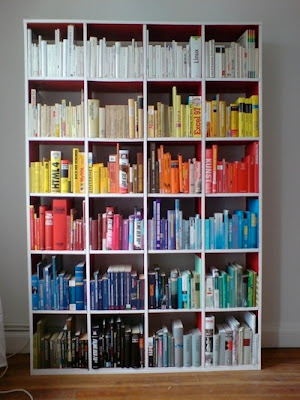 Add chromatically arranged books to my list of design don'ts!